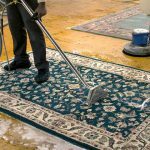 Reilly’s Oriental Rug Cleaning is your go-to service provider for an exceptional wall to wall carpet cleaning solutions in Northern New Jersey. For over a century, residents in Northern New Jersey have trusted us with all their wall to wall carpet cleaning needs. Wall to wall carpets (also known as fitted carpets) are carpets that are fitted to cover the entire floor of a room. These carpets are normally stretched and fitted with a special tool that ensures that they fit exactly with no space between the wall and the edge of the carpet. These types of carpets are very common in offices, hotels, and homes. They also come in a wide variety of colors and designs. Wall to wall carpets needs to be cleaned regularly as they can accumulate a lot of dirt particles. These include food crumbs, soil, dust, and many others. These particles make the carpet look dirty and can even make the carpet uncomfortable to step on. What are the Benefits of Wall to Wall Carpet Cleaning Services? Hiring a professional to clean your wall to wall carpet is one of the most important things you can do to keep your property clean and safe. Professional wall to wall carpet cleaning services can help extend the life of your carpet. This is because the particles that were mentioned earlier may cause the fibers of the carpet to split and deteriorate. Professional wall to wall carpet cleaning services also ensures that the original colors of the carpet are well-maintained, keeping your overall home décor looking amazing. Reilly’s Oriental Rug Cleaning is simply the best when it comes to the wall to wall carpet cleaning. We are a family owned business that puts the needs of our customers at the forefront of everything we do. We offer well-priced carpet cleaning services ensuring that we are gentle on your wallet. We take particular pride in our state of the art equipment that ensures we do an excellent job when it comes to cleaning your wall to wall carpets. Since our inception, Reilly’s Oriental Rug Cleaning has been a trusted carpet cleaning company in Northern New Jersey for over a century. Our clients trust that we can get the job done nicely and in an affordable way. To that end, we give you a cost estimate upfront before we start the cleaning process so you know right from the start what our services will cost you. Are you interested in using Reilly’s Rug and Carpet Cleaning’s wall to wall carpet cleaning services? Do not hesitate to call 201-445-0800 or email us at Info@RugClean.net for more inquiries.